Torna sulle pagine della storia in questo viaggio di 10 ore nell'antica Alessandria, visitando la Biblioteca della Bibliotheca Alexandrina e le catacombe e le fortificazioni della città con l'aiuto di una guida privata. 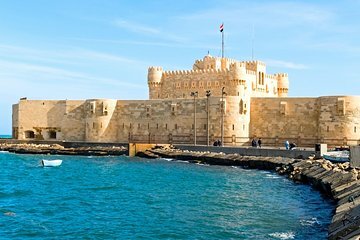 Unisciti a un egittologo per un'esplorazione di questo centro millenario di civiltà sul Mediterraneo. Visita la moderna incarnazione della famosa "Biblioteca di Alessandria" della città e scopri le Catacombe di Kom El-Shoqafa prima di scoprire la Cittadella di Qaitbay, una fortificazione difensiva chiave. Il viaggio include anche il pranzo, il veicolo privato, i biglietti d'ingresso e il trasporto alberghiero di andata e ritorno. This was not the tour we expected. We wanted to go inside the Library in Alexandria. Our guide told us that there is nothing to be seen in the Old Alexandra Library. Instead of viewing the Library we stopped for ice cream and local bananas. Please find another tour than this, it was a waste of our money 375.00 and our time. Roxie B. On time and off we went for 3 hour ride to Alexandria. Nassar was knowledgeable,helpful and considerate with planned rest stops each way. Traffic in each city is like the best video game you have played as cars, trucks, buses and motorbikes dance across the road disregarding any lane markings, but Harun our driver did a wonderful job of navigating the chaos. .
Really enjoyed the catacombs except the rising water restricted viewing to the 1st floor versus the 3 floors advertised. Would check ahead of time as problem definitely seemed to be worsening. All exhibits here did not appear to receive the same consideration, restoration or care as those down the Nile but are displayed as found. Still interesting to contrast Roman influence on the early history. Wonderful lunch at Fish market before returning to Cairo and re-encountering evening rush hour. An unexpected stop at an essential oil store delayed our return to the hotel. The guide was very good and helpful but should learn English a little bit more. I really enjoyed this trip. I thought the departure time would have been too much to handle but the trip was excellent. Nasar was very informative and I would recommend him to anyone traveling to Egypt. This tour was okay. It is about a 3 hour drive from Giza each way. There wasn't enough in Alexandria to really make it worth the trip. Our tour guide was nice and went above and beyond for us. wonderful, informative, and courteous driver and travel guide.